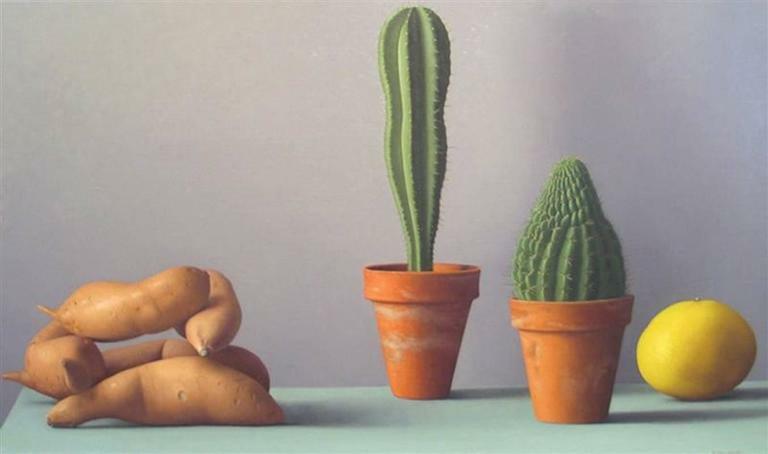 This Still Life with Sweet Potatoes and Cacti is no longer available. Signed (at lower right): A. Weiskopf Though Weiskopf is a master of the still life genre, her paintings are anything but traditional. Absent are the conventional subjects of centuries past. Instead of peonies, delftware and crystal, Weiskopf paints crooked cucumbers, peeling onions and multi-colored squash. Her exotic objects exist in imaginative and often surreal settings, seeming to engage in a lively and poignant dialogue with one another. The empty space between two objects is just as important as a faint touch or an overlapping embrace. The relationship between the objects in her paintings is paramount, as Weiskopf places each item with careful deliberation, asking the viewer to contemplate just how and why they interact. Weiskopf’s sophisticated use of light and color take her elegant painting to new heights. Weiskopf’s work can be found in The Metropolitan Museum of Art, the Arkansas Art Center, Little Rock, as well as in numerous private collections. Amy Weiskopf was born in Chicago in 1957, and received her M.F.A. from the Tyler School of Art, Temple University, PA. She currently lives and works in Brooklyn, NY.